Here are 5 (based on number of followers) Spas & Salons in LA that do their social media in style. We've also provided a brief summary of our take on what they do, that's different - beyond the regular special offers and greetings on Mother's Day. Want to know more about local businesses rocking social media in your own neighborhood?. The Free EyesAndFeet application has all the details. PS: we haven't included the big chains (Supercuts, GreatClips, etc) in this list - it just wouldn't be fair - or interesting for that matter. So there you have it: all independent establishments! Read on...to get some ideas on how you could engage with your followers - in hair raising ways. FRIDAY FUN DAY!!! This Korean Day Spa pampers its customers on Twitter with interesting content and videos like this one: http://fb.me/12jI985gE. Have more than 140 Characters to say? Simply write a blog post & tweet about it. That's exactly what this fancy Hollywood Salon does often - tweeting links to their blog posts. It's mostly business here. With most tweets conveniently listing their phone number, we're sure they have their phones ringing often. Hollywood, new styles, fashionistas - they do it all. Tweet about your Events, Offers & Reminders and more importantly tweet about them regularly, the core twitter strategy of this Upbeat LA Salon. 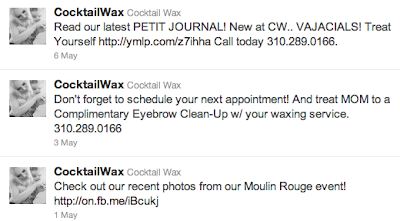 Of course, an interesting twitter handle like Cocktailwax helps too! What does the Dalai Lama have to do with hair dressing ? Osama is Dead and you need Shave off your beard ?